I know that many have already heard the story of Ada Lovelace, and here is another book about her, this time focusing on her childhood and the path that led her to the mathematical thinking that preceded (by over a hundred years) the invention of the computers we know today. Perhaps some have heard of Kathryn Johnston, the first girl to play little league baseball, yet although I grew up in her time, I had not heard her story until Heather Lang told it in this picture book of a passion fulfilled that made history. It's terrific to hear stories that show both passions and persistence resulting in good things we now appreciate. 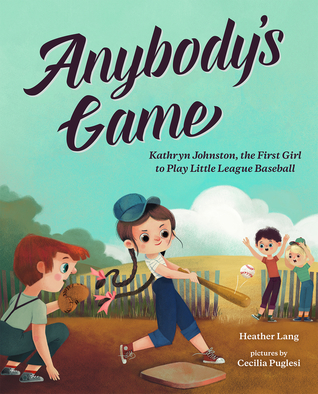 Kathryn Johnson loved baseball, loved her father's glove, even used it for a long time though it was for right-handers, and she was a lefty. Frustrations grew when Kathryn's brother tried out and made the local little league team. She knew she was better, but because she was a girl, she had to stay back, play only in local sandlot games. That itself was an honor because those local players recognized how good she was and invited her to play. There came a time for the tryouts of a new little league team. Frustrated again, Kathryn decided, with her mother's help and approval, to cut off her pigtails, borrow her brother's clothes and tryout as a boy! How it all turns out shows that risk-taking often means success! Cartoon-like illustrations by Cecelia Puglesi show this time in our history well. 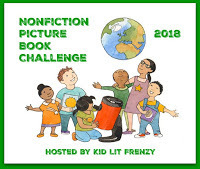 The pages show only white children, Mother in the kitchen wearing an apron, girls playing hopscotch, and Dad wearing a sweater vest. The backmatter includes an author's note and a timeline of women and girls in baseball. Heather Lang has written another wonderful biography of a story that will be inspiring for young people to read! Like "Fearless Flyer" and "Swimming With Sharks", she shows that taking that next, sometimes frightening, step can make a difference for self and for others! Thanks, Heather! 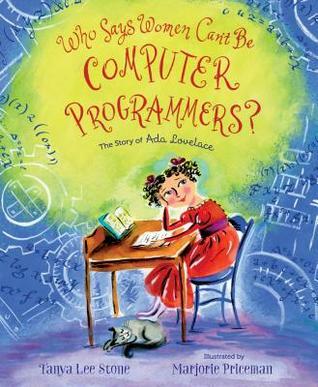 This new book about Ada Lovelace not only tells more of her story as a young girl, illustrations by Marjorie Priceman fit the Victorian age in which Ada grew up and include real numerical equations researched by Tanya Lee Stone. Ada, perhaps like her poet/dreaming father, Lord Byron, was also a dreamer, thus Ada was punished at times by being put in a closet when she doesn't please her mother's expectations. Her mother, according to the text, "was hoping to protect her from what Lady Byron believed were the dangers of a vivid imagination such as her father had." We are told that Ada spent many hours alone, her only companion, her cat, Madame Puff. She was tutored from an early age that focused on mathematics, and Ada was also studying French and music. She liked many other things but was denied learning about them as she grew up. As a young adult, her friendship with the scientist, Charles Babbage kept her mind occupied. How exciting it was to see his new inventions, to read his articles. They wrote each other often, and the crowning point was that Babbage told Ada she should write her own original paper. Ada's longer explanation of his own invention now shows it to be the precursor that explains how computers work. There is "more to the story" in the back matter and an added little bit about how Ada Lovelace got her name. Thanks to Tanya Lee Stone, readers have another glimpse of this important woman who followed her passions. It's a wonderful book! Labels: Anybody's Game, NFPB Wednesday, Who Says Women Can't Be Computer Programmers?